Generally, I like to have some local currency with me before I even arrive at a destination. Yes, the ATMs in the destination country probably offer better exchange rates than the exchange bureaus at home, but having some cash gives me some peace of mind. Sometimes, ATMs refuse to work with foreign debit cards for no reason — this has happened to me before and I’ve learned my lesson. Before a trip, I usually prepare just enough cash to get me from the airport to my accommodation, a few meals, and a few taxi rides in case I get lost. In other words, just enough cash for emergencies. The amount depends on the country, but this is usually about $100 or $200. But before I visited Japan, knowing that I wouldn’t be able to use my credit cards, I exchanged enough cash to cover all my meals and other expenses for the first couple of days. There are ATMs you can use at the airport, but have some cash with you anyway in case you can’t withdraw money immediately after arriving in Japan for some reason…which brings me to my next point. 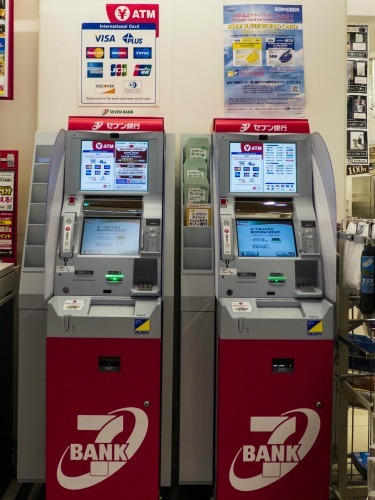 Most ATMs in Japan don’t take foreign debit cards. Luckily, ATMs that do accept foreign debit cards are everywhere. You just need to know where to find them. When you’re short on cash, just look for a 7-Eleven. This is pretty easy because there are 7-Elevens all over Japan and they’re open 24/7. In the rare occasion that you can’t find a 7-Eleven, use the handy ATM locator here. 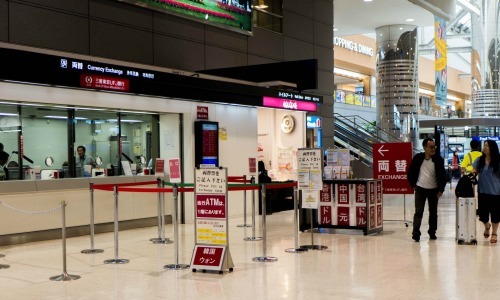 You can also withdraw cash from Aeon ATMs inside Aeon malls and Japan Post ATMs in post offices, train stations, and supermarkets. If you have an account at Citibank, you can also use Citibank ATMs, but they’re not as widely available as the other options. These ATMs accept major cards from Visa, Mastercard, Maestro, Cirrus, and a few others, depending on the particular ATM. The ATM should have a sign that says it accepts international cards, along with the logos of the cards it accepts. See how it says “some cards of the same mark may not be used”? Like I said, sometimes an ATM wouldn’t take your card for no apparent reason, so do bring some cash with you from home. These ATMs generally let you choose a language immediately after you insert your card, so the instructions are easy to follow. Remember to use your debit card and not your credit card to avoid being charged cash advance withdrawal fees. 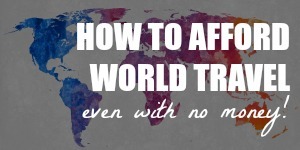 And if possible, get a debit card with no foreign transaction fees and no currency exchange fees. If you have a fee-free credit card, it’s generally a good idea to use it as your main payment method when you travel because of the convenience and the excellent exchange rates. However, you will not be able to do this in Japan. During my five days in Tokyo, I only came across three establishments that offered to let me pay with a credit card. And one of them couldn’t charge my card for some reason. 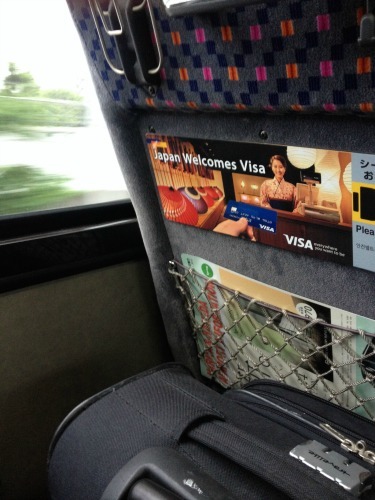 An ad on my bus from Narita Airport — it lies! Your credit card will be a back-up payment method in Japan. But you may come across stores and restaurants that accept credit card payments, so as usual, bring more than one credit card with you in case a machine wouldn’t play nice. This could happen even if you’ve made all the necessary precautions before leaving your home country. The exchange bureaus I came across in Japan accepted a wide range of currencies. Besides USD, they also took CAD, AUD, SGD, HKD, RMB, KRW, etc. I stayed in the Shinjuku/Kabukicho area, so I also saw a lot of these money changers in strategic spots. However, they may be hard to find if you’re in a quieter area or you need to withdraw some cash urgently. They also don’t offer the best exchange rates. Seriously, save yourself some time and use a debit card at 7-Eleven instead. Those ATMs are everywhere and they likely offer better rates. But if you’re in a tight spot and you need to exchange your travelers checks or foreign currencies for the Japanese yen, there are several places where you can start looking. Some big hotels and banks have currency desks where you can exchange foreign currency and/or travelers checks. 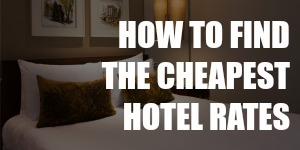 However, hotels may choose to only provide this service for their own guests and not all banks will take your foreign currency. In Japan, you have to pay a tax of 8% on your purchases. This tax will go up to 10% in October 2015. Some stores in Japan waive this tax if you’ll be bringing the items you purchase out of the country. These stores usually have a sign saying “tax-free shopping” or something similar. Only certain items worth over 10,001 yen sold from tax-free stores are exempt. From October 2015, some consumable goods worth more than 5,001 yen will also be exempt. The sales associates at the store should be able to advise you on whether the item you’re purchasing is exempt and let you know how to qualify for the exemption. The process may differ from store to store. Just remember to have your passport with you if you’re planning to shop because you won’t qualify for the tax exemption otherwise. And now with all the money stuff sorted, go have fun in Japan! Great tips! I actually did not rely a lot on credit cards when I travelled in Japan. Good to bring more cash! Right! I was surprised by how little they used cards over there. 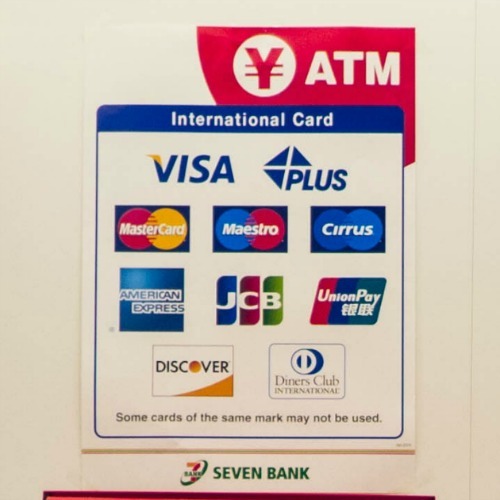 Aeon Bank ATM also accepts foreign cards not only Post Office and Seven Bank ATM, by the way. Good tips, we always use ATM’s. 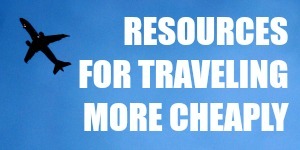 We get the best rate and our CC has no fee’s so it’s simply the only thing we use. It surprised me all the people who use money exchanges. Agreed, David. Those ATMs are so much more convenient than the money exchanges too! 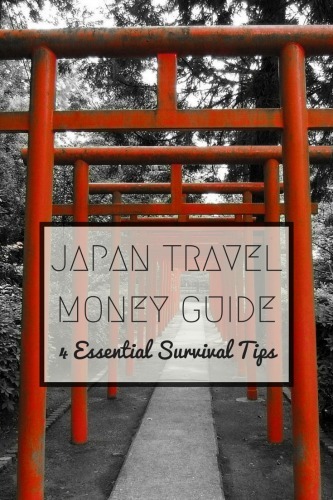 great tips – money in Japan can often be surprisingly tricky to organise. Outside of your 7Elevens (which is def the place for ATMs) most actually close down outside business hours! especially out of the main cities. Actually I remember I tried to use one at Haneda Airport at 630pm about to fly out and it said it was closed until the next Monday! ATMs can be so temperamental! They usually offer great exchange rates, but I’m not gonna count on coming across the right ATM at just the right time. Better to be safe and always keep enough cash for emergencies.